In 1983 Ultimate Play the Game released a rather unusual game called "Pssst" for the ZX Spectrum, in which you played as Robbie the Robot on a personal struggle to stop deadly garden pests from swarming and eating at his lovely garden plant. 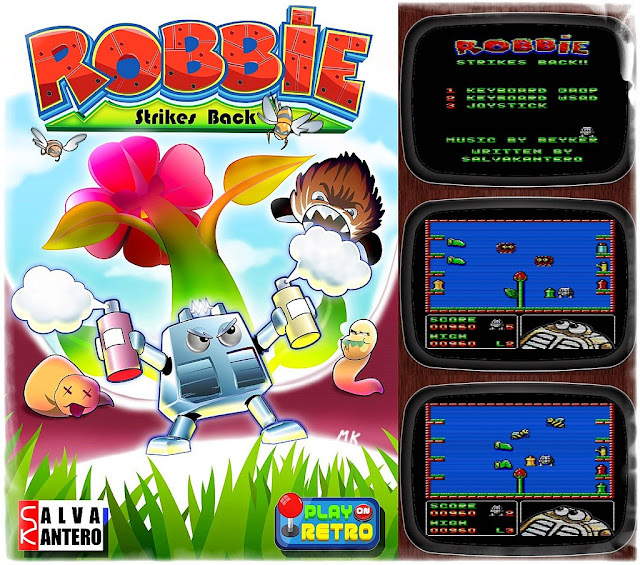 If you remember this fun game you'll be pleased to know that today Salvakantero has released an updated Amstrad version of this game as a conversion of the original classic! Once again you play as Robbie the Robot who has come back to his garden to grow his favourite flower the “Thyrgodian Megga Chrisanthodil”. But yet again the garden is invaded by evil and opportunist insects that require you to put a stop to them with a good dose of the right bug spray. Be aware that if you use the wrong bug spray for the wrong insect, it may paralyse them or not work at all. So do make sure to get it right as if you fail, your flower will get eaten!